Over the six years he has headed the Peterborough Downtown Business Improvement Area (DBIA), executive director Terry Guiel has told everyone and their brother that city residents are passionate about the downtown core — and have plenty to say in regards to its future. The proof was in the pudding Wednesday night (April 10) at the Peterborough Public Library, as a lively and engaged citizenry participated in the “Shaping Your Downtown” input-gathering event hosted by the Peterborough DBIA. 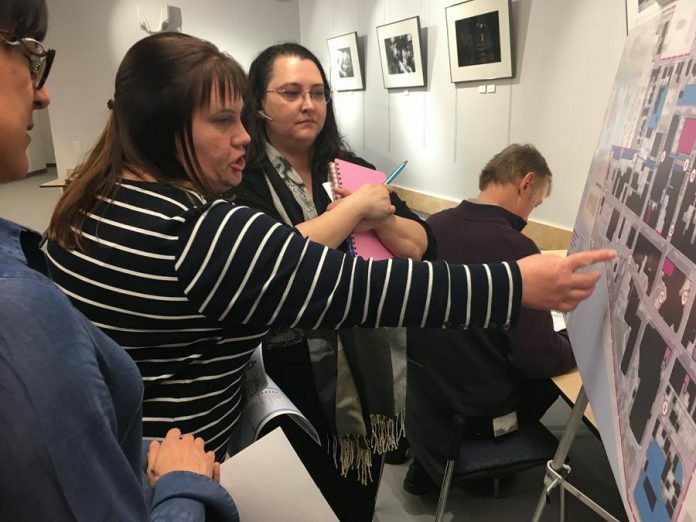 With the organization in the midst of developing a new five-year strategic plan for adoption later this spring, the event was held as part of the ‘homework’ phase of that process. 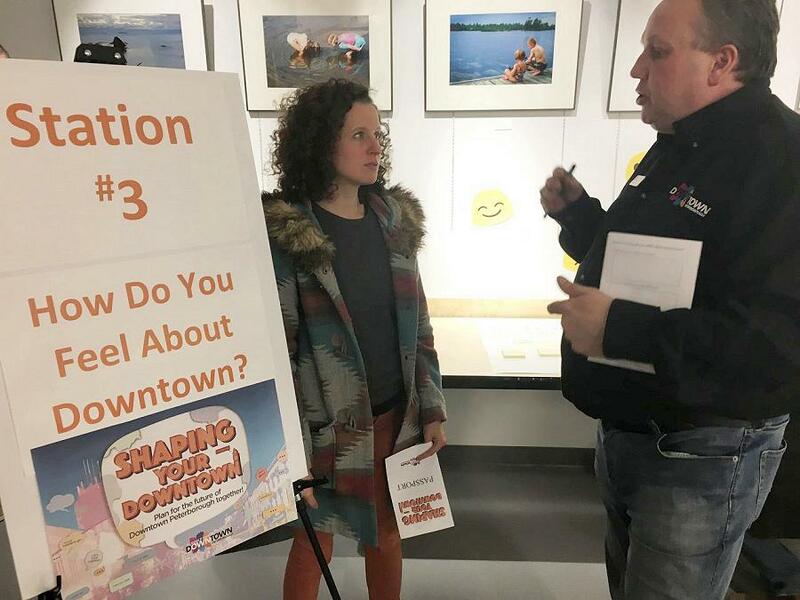 To that end, visitors made the rounds to four designated stations themed ‘Getting To Know Your DBIA’, ‘What Do You Do Downtown?’, ‘How Do You Feel About Downtown?’, and ‘Opportunities, Challenges and the Future of Downtown’. 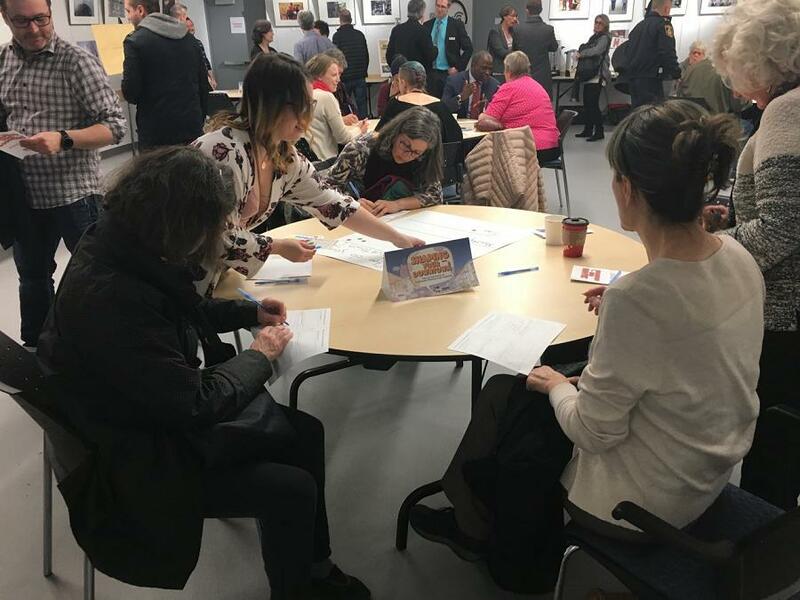 They wrote their responses to questions grouped under each theme and left them behind as input for the Peterborough DBIA’s strategic plan process. “We’re only as effective as implementing what our community wants to see,” said Guiel. According to Guiel, a similar event was held in 2014 but it wasn’t “as robust as this one”, in the sense that input gathered this time around will directly help shape the vision as outlined in the pending five-year strategic plan. Facilitating the process for the DBIA since the beginning of the year has been BIA Solutions, which works closely with Business Improvement Areas (BIAs) across Canada. “Many BIAs are resource scarce, they are stretched, they have very few staff if any, and yet they have a very big mandate to serve their members and their communities,” said Lyle Shipley, a partner with BIA Solutions. “When you’re in that situation, you really need to be efficient with how you use your resources. The best way to do that is to start with having a strong strategy that’s informed by consultation with your members and by an understanding of the past and the present as well as the potential future. “We started here by doing a discovery process where we looked at all the materials and articles and past work that has been done by the (Peterborough DBIA): past issues, past strategies, past business plans — all these different things — and aggregated them into a report. Representing more than 400 businesses, Peterborough DBIA’s mandate is to promote and beautify the downtown core as well as advocate on members’ behalf when matters arise which impact their businesses. In addition, the DBIA annually organizes a number of community events to bring more people downtown, such as Taste of Downtown, Ribfest, and Hootenanny On Hunter. 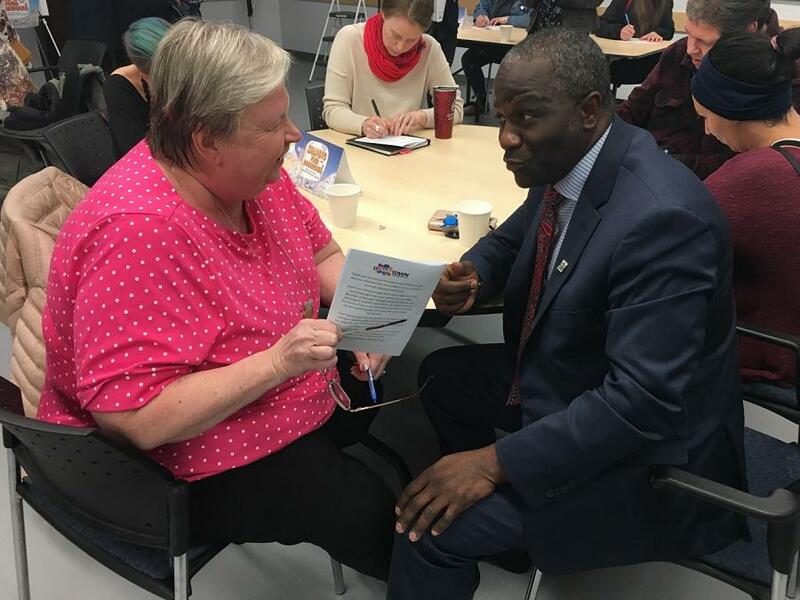 Both Bennett and Guiel readily admit there are very real challenges, with negative perceptions held by some people who stay away from the downtown core. “You counter that by listening and that’s why we’re here tonight … to find solutions,” said Bennett. For his part, Guiel says the Peterborough DBIA needs “some other people to do the heavy lifting” when it comes to tackling challenges associated with the downtown core. According to Shipley, it’s important that the pending strategic plan become a living document. Shipley added Peterborough is well served by its DBIA. “I think they’re really hard on themselves in terms of having issues downtown,” he says. “The city is going through a lot of changes and is trying to grapple with some very significant issues that could change the face of downtown. The DBIA is doing so many things and they’re doing them at a high level. “They just recently collected an award at the Ontario Business Improvement Area Association Conference in Ottawa (for the Downtown Vibrancy project that saw an unused section of Water Street transformed into green space). Many of the programs and initiatives they’re running are models.